The premier regional sales & service provider of on-line process analyser, metering instrument and laboratory equipment for the oil & gas, hydrocarbon processing, petrochemical, energy sector, R&D and general industries. 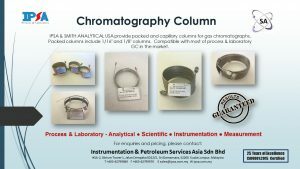 We are pleased to introduced you our Chromatography Column by Smith Analytical LLC, USA. Packed columns include 1/16″ and 1/8″ columns. The columns offered are compatible with most of process & laboratory GC in the market. We are happy to discuss with you about your existing configuration and we will be able to offer you our competitive solutions. For enquiries, applications and pricing, please contact us at sales@ipsa.com.my or +603-62799980.